Equestrain rider Laurentia Tan, now 33, has just won a bronze in the Paralympics Grade IA individual championship dressage test, Singapore’s first medal at the London Paralympic Games. She first made news for winning Singapore’s first medal at the Paralympics Games at Beijing 2008. It was also Asia’s first Paralympics equestrian medal. Doctors once diagnosed her as ‘spastic’ and unable to walk, and told her parents that she would lead a life of a vegetable. Laurentia has come a lot way in overcoming all odds to achieve her dreams. Even though she was profoundly deaf, she performed on form in competitive world riding competitions where she was cued by music! While eating can be a straightforward task to many, it is a challenge to Laurentia who had developed cerebral palsy due a complication of jaundice after birthday. For many years, she was not able to use the usual chopsticks, and had to use special ones that were joined at the top. She was seldom successful as they were often not strong or flexible enough, and would end up breaking numerous pairs. But nevertheless, she was determined to use the normal chopsticks in what she thought were weird and wonderful ways. It first started with fishballs where she would poke a single chopstick through them. And when it came to eating her favourite prawns, the chopstick would go through the middle of the prawn, as though it was curling around the stick. Alternatively, she would use the two chopsticks like a spoon and try to balance meat on two chopsticks, rather than holding it in between. It was until in her late teens that she thought she tried using chopsticks with her left hand instead (even though she was right handed), and there was that “Eureka!” moment. While many of us would just give up after failures, she opened my eyes on how we can always work around things and not allow ourselves to be beaten. When asked about food, she would sparkle at the thought of her love of seafood such as lobsters and crabs. However, she doesn’t crave for them that much as she could get them fairly easily at London where she is based. 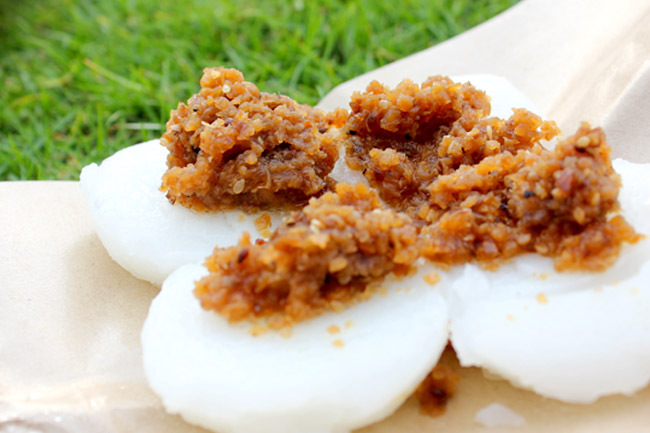 The one thing she would really love to have is a simple Chwee Kueh, which she would describe as little steamed rice cakes with salted vegetable on top. She warmly remembers how her paternal grandfather would go to the market in the mornings to bring home breakfast for the family. Sadly he had passed away, but memories will stay. Unfortunately, the Seletar Chwee Kueh that she used to have a child is no longer available after the market was demolished. She promised herself that she would try the famous ones at Tiong Bahru the next time she comes back. Everything I see Laurentia’s article in the news, I feel proud of her, yet ashamed of myself. As we cross hurdlers in life, giving up seems so easy and straight forward. But we always take things for granted, such as a very ordinary thing like eating with a pair of chopsticks. Laurentia has taught me so much – on how we can appreciate the simpler things and moments in life. ← Paris Baguette – Korean Bakery In Singapore, But Why Seoul Expensive? Banban,u must pray for me so that I can survive all ordeals and overcome all obstacles. Which is known for its xenophobic stance, and plagarising from other websites among other things. Just checking to see if you have given them permission to publish in full. You may be very much aware that they get advertising dollars and you can actually take them to task as there is a profit motive behind it. Thanks for alerting. How can they do that? They didn’t even bother to ask! And this is so sad, because Laurentia’s story taught us how we should work hard every step of the way, not take short cuts. You can always write to them requesting to take down. It’s definitely a copyright infringement especially if they are making money out of ad revenue.